Double Diaphragm windmill in multiple sizes, made with galvanized steel and runs an air pump that will pump air down a tube and out an air stone. Works in as little as 3-5 mph winds. PLEASE CALL IN TO PURCHASE. We would like to discuss with your pond size, your aeration needs and other information so that we can help you purchase the right windmill for your pond or lake! This double diaphragm compressor pumps double the air volume of the single diaphragm, ideal for ponds larger than 2 acres or oddly shaped. Providing more oxygen to your pond allows you to help turn stagnant water into a clean, odor free paradise. This dual diaphragm system uses galvanized windmill heads made with 18-guage galvanized steel and has a self-governing windmill head that functions in winds as little as 3-5 mph, so you don’t have to worry about power even on the least windy of days. The double diaphragm is the only difference between this and the single diaphragm windmill. This windmill runs an air pump that will pump air down a tube and out an air stone. This is bottom aeration that is necessary in helping move stagnant water off the bottom of ponds to get a more even oxygen mix. 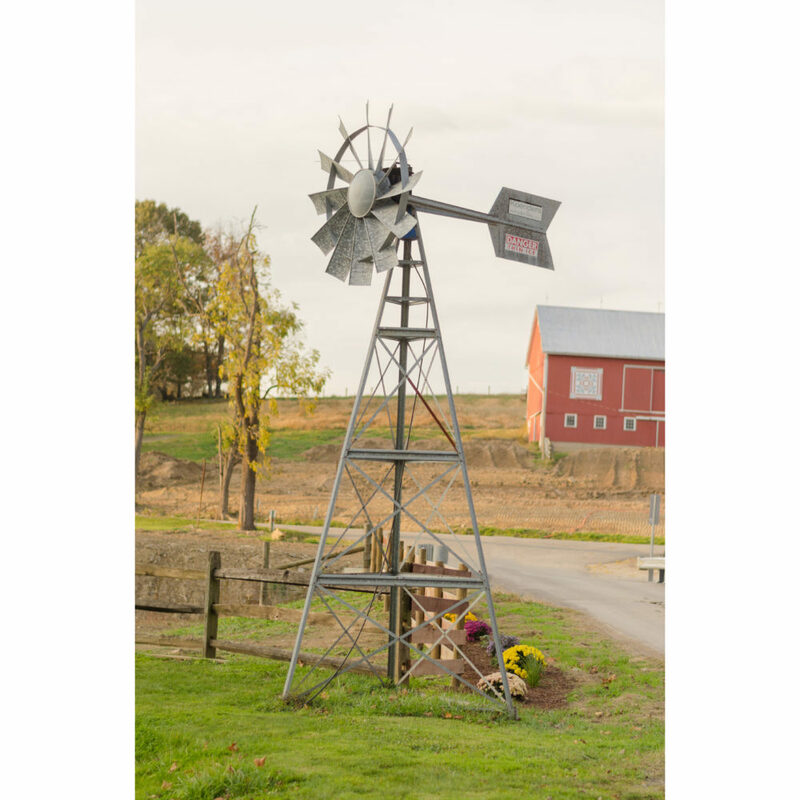 All of the windmills we sell are galvanized or powder coated. Ask us about the lawn windmills we now handle, which can be put up just for looks or used as functioning garden pond aeration. You can find a link to the Koenders windmill accessories by clicking here. Access airline, stones, hinges and more. It is important to note that the windmill pictured is 25+ years old, sitting on the hatchery farm. This goes to show how well these windmills look after all of this time. These windmills are a quality that can last for a long time.